Helping Ninjas is a student-led organazation and is supervised by adults and parents who all share the same visioin to the importance of creating awareness of educating our youth how to help the planet, themselves and each other. Fresh Snacks Initiative is a movement and an effort to educate the youth on fresh snacks, and the unique tastes and benefical nutrients from eating foods that are plant based and nutritious. An initiative to bring awareness to the importance eating fresh foods and supporting education to youth, parents, guardians, educators, students, parents creating awareness of the benefits of eating fresh snacks in hopes to inspire. An initiative to provide youth with an opportunity to learn about and enjoy fresh, healthy snacks at home, at a friends house, at a restaruant, traveling in the car or on vacation, in a school lunchbox or even at school during class time. Helping Ninjas was inspired to create an iniatitive where youth are periodacally givent he opportunity to enjoy fresh snacks in and out of classrooms. Exploring the idea of providing fresh snacks alongside an informative fact sheets given to the youth to support education of nutritous foods and beneifts to health. Striving to educate and encourage fresh snacks to be presented to youth at a time when they might normally not want or ask for or are more likely to be hungry and when they are more apt to eat it – a concenpt that was created with the help of a helping ninja’s kindergarten math teacher. . The inspiration of this initiative came from a “pilot” of this idea and concept during one Helping Ninja’s math class at her school in which she was attending Kindergarten. Her mother donated fresh fruits and vegetables to be given to all students to enjoy. The fresh snack donation was an idea for an alternative then normally donated perishable snacks; the teacher had recently requested snacks to be donated to the classroom, and her mother thought, why not donate, “Fresh Snacks? The teacher thought that it was a good suggestion, welcoming it and thought it to be a great idea to try. So, she and her the helping ninajs father did for consectutive weeks following the initial idea; once a week, they donated fresh snacks, such as organic apples, oranges, bananas, carrots, etc. enough for one day sometimes two.. And the results proved successful, the fresh produce was being eaten by her daughter and other math students. Through the help her daughter’s math teacher, the teacher and she decided to issue a sign-up genious promoting a fresh snacks iniatative and sign up to volunteer, where parents had the opportunity to participate in fresh snacks being donate to the math class twice a week for approximately 7 weeks – just to see if other math parents may be interested in trying.. The sign-up genius was successful. Her daughter ate an orange for the first time. 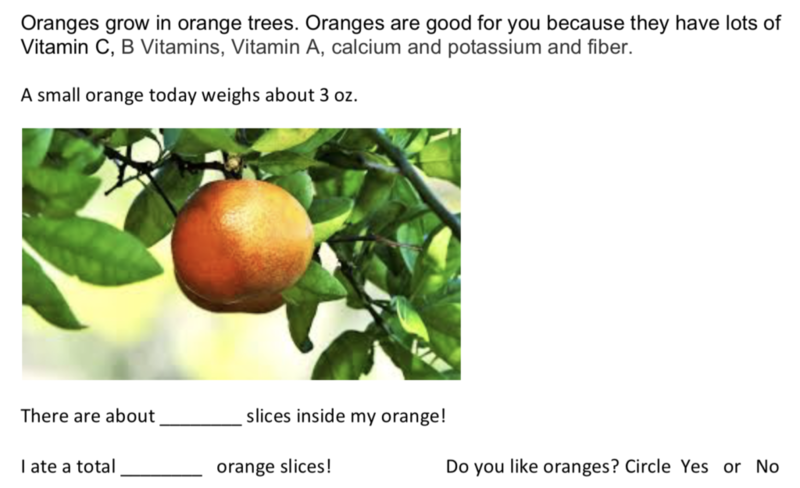 She attributed this to the fact that her daughter was hungry, math class was late in the day and had been a few hours since an mid-morning lunch and that their were no other options to be had and her other class mates were all given the same option, an orange. Upon doing this two weeks in a row, her mother had seen a difference in her daughter’s energy level upon coming home from school on the days she had been given the fresh snack. (Compared to ther days when she was not; she would be low-energy,, emotional, hungry and off balanced). On the days she ate the fresh snacks she came home energetic, happier and more willing to share information about her day as well as eager to share her fresh snack experience at school with her mother, portaying confidence in her choice to make a healthy food choice. Similiar experienes were shared from other parents (whom were neighbors and friends) who shared the same math class saw in her daughter, they too were witnessing a similar postiive differences.. This Helping Ninja inspired her mother an iniatative for fresh snacks. Photo: Enjoing fresh snack in math class. This prompted the idea to continue sharing what they had learned during this neat experienec, concept and opportunity that her daughters math teacher was willing to povide and try it! It prompted the idea for Helping Ninjas to encucourage and educate and try to provide fresh snacks for youth at home, in or out of school, at a club – anywhere youth are eating snacks – an idea to start a movement and an initiative encougaing others to provide fresh snack options and opportunies to our youth to educate and inspire them by tryiing fresh foods and to experience the health benefits as well as hopefully to inspire to choose healthy options. Thank you to the math teacher of this helping ninja who shared the same idea as her mother; an idea that allowed this opportunity for youth to experience the benefits that may accompany the occurance of providing fresh snacks to our youth! *This idea and concept also helped to inspire the schools kindergarten to suggest and request that parents donate a daily snack for their child, giving exanples of healthy, non-sugar options for the students to enjoy during class. If you would like to join this movement, initiative and effort please contact us. Helping Ninjas inspire to learn how to make their own fresh snacks! Helping NInjas have compiled a list of their favorite snacks, Garden Fresh Snacks here you can see examples of fresh snacks to make at home or to send in a lunch to school or as a snack. Have a recipe or snack idea you want to share with us? Email us here. Are you, or do know someone, that is helping to share this passion for foods from the garden? Email us, join our movement and efforts to share with others to spark inspiration for others to try plant-based foods. *Allergy Friendly Example Snack Items For A Group or a classroom setting.